TILLERSON WARNED THAT IF TERROR GROUPS CONTINUE TO PROLIFERATE IN PAKISTAN, THEY COULD THREATEN THE VERY STABILITY OF ITS GOVERNMENT. The 64 year old Texan who worked as CEO, M/s. Exxon Mobil, which has about 75,000 employees around the world, is new to the diplomatic world. The former Oil Executive was set to retire when President Donald Trump tapped him up for one of his government’s biggest role, ie., US Secretary of State. He is a man of liberal policies. He recalled going to visit Mr Trump, thinking he was just sharing thoughts about the world, and was shocked when he was offered the role. He was persuaded by his wife to take the job. During his Meeting with Shahid Khaqan Abbasi, Premier of Pakistan, Mr.Tillerson discussed Pakistan’s critical role in the region, bilateral cooperation and partnership, expanding economic ties between the US and Pakistan. Earlier, the US embassy said that the US secretary of state reiterated Trump’s message that “Pakistan must increase its efforts to eradicate militants and terrorists operating within the country.” Besides Prime Minister Shahid Khaqan Abbasi, the meeting attended by Foreign Minister Khawaja Asif, Interior Minister Ahsan Iqbal, Minister for Defence Khurram Dastigir Khan, Foreign Secretary Tehmina Janjua, Chief of the Army Staff General Qamar Javed Bajwa, ISI chief Lt. Gen. Naveed Mukhtar and other officials. US Secretary of State Rex Tillerson delivered a blunt message to Pakistan to increase its efforts to eradicate terrorists operating from its soil. The first high-ranking US official to travel to Pakistan after President Donald Trump unveiled his new strategy for South Asia in August. It is expected that his visit would set the tone for future engagement between the two sides on bilateral and regional issues. LAST CHANCE: Trump has vowed to get tough with Pakistan unless it cracks down on terrorist groups such as the Taliban and the Haqqani Network. President Donald Trump has vowed to be tougher on Pakistan than his predecessors. The United States has threatened further military aid cuts and U.S. officials have mooted targeted sanctions against Pakistani military figures, but in the past two weeks there have been hints of a slight thawing in ties. The US and India agree that Pakistan must work to immediately get rid of terror safe havens operating there”. The U.S.’ South Asia policy can succeed only when Pakistan acts on terror groups, says Sushma Swaraj. ”India and the US discussed, that no country in the world should provide safe heavens to terror groups. Any country backing terrorism must be made responsible; the U.S.’ South Asia policy can succeed only when Pakistan acts on terror groups. “I am happy to inform that our defence and strategic relations have deepened after PM Modi’s US visit. ”The important contribution of Indians working in the USA on H-1B visa has been pointed out”. State Department spokesperson Heather Nauert said in Washington last week, Mr. Tillerson would meet with senior Indian leaders to “discuss further strengthening of our strategic partnership and collaboration on security and prosperity” in the Indo-Pacific region. Mr. Tillerson’s visit also comes at a time when the Trump administration is “considering” India’s request for armed drones for its air force. Earlier in 2017, the IAF had requested the U.S. government for General Atomics Predator C Avenger aircraft. It is understood that the IAF would need 80 to 100 units, making it approximately a whopping $8 billion deal. 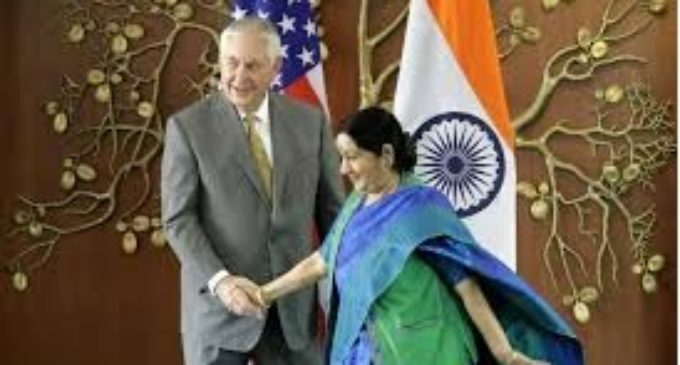 Tillerson, who is in India as part of his five-nation visit, echoed Swaraj’s views said that “terror safe havens will not be tolerated. He said that “India and USA are natural allies; we stand shoulder to shoulder against terror.” Tillerson, who visited Islamabad before New Delhi, warned that if terror groups continue to proliferate in Pakistan, they could threaten the very stability of its government. About Pakistan’s harbouring of terrorists and its support of terrorism, Tillerson says, “In my discussions in Islamabad, we were frank to conclude that there are too many terrorist outfits that find a safe haven in Pakistan. We are putting in place a mechanism to deny these outfits the ability to launch attacks on other countries.” We want to work with Pakistan in a positive way as we think this is in their interest in the longer term,” he said. In a joint statement with the Sushma Swaraj, he said that “we are ready to provide the best technology for India’s military modernization.” “US backs India’s emergence as a leading power and will continue to help Indian capabilities in providing security for the region. He was “looking forward to discussing deals for F16 and F18 fighter jets with India.” He also asserted that America’s relationship with India was of strategic importance and was not limited to South Asia. In a major India-policy speech, he quoted that the U.S. was India’s “reliable partner” at the world stage in this period of uncertainty and angst. He also referred to the rise of China, saying its behaviour and action were “posing a challenge to the rules-based international order“. Ahead of Mr. Tillerson’s three-day visit, the External Affairs Ministry had said that there will be detailed discussions on further strengthening India-U.S. partnership. Tillerson’s meeting with Sushma Swaraj comes after a meet with National Security Advisor Ajit Doval in New Delhi on Wednesday morning. He also laid a wreath at Raj Ghat. He will hold talks with Prime Minister Narendra Modi.